Material: Fiber, Plastic and Metal. Total length:10 cm (3.93 Inches)- give you the better control and easier to pack in the makeup bag. *Brand new and high quality. *Easy to use and convenient to carry. *Professional makeup tool, which can curl or comb the eyelashes. *Perfect for separating eyelashes before or after mascara application and running through your lashes / eyebrows. *Work well on eyelash extensions or even fake lashes. *Suitable for professional beauty salon and personal home use. G2PLUS is a registered trademark in United States of America, please confirm before you buy, other sellers sell without our authorization is fake products and you won't get 100% Service Guarantee. *Color:100 Pcs rose red and 100 pcs black. *Size:Head size:approx 2.6cm/1.02 in.Whole size:approx 10cm/3.93 in. *Use:Eyebrows brows,eyelash extensions,mascara application,makeup applications. 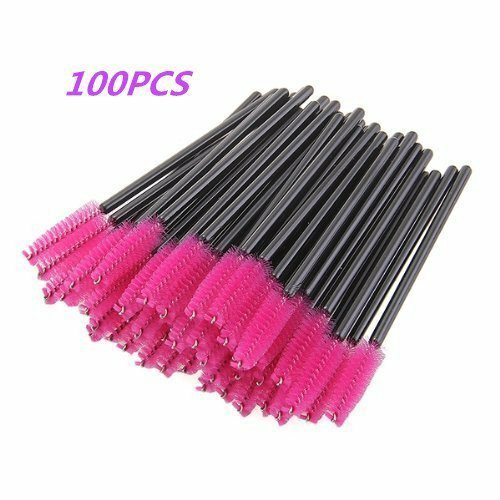 200 PCS lash brushes-100 Rose Red & 100 Black. *** Guarantee: Not satisfied.Full refund provided! 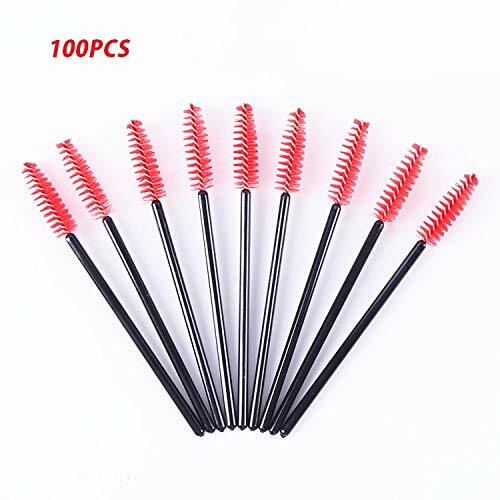 Eyelash Brushes Makeup applicator kit:200 pcs mascara wands,include 100 Pcs rose red and 100 pcs black. Eyebrow Brush Perfect for separating eyelashes before and/or after mascara application.Perfect for professionals beauty salon or home personal use. Daily application These eye lash brushes are great for eyebrows brows,eyelash extensions,mascara application,makeup applications. Convenient Design More handy and easy to use.No more clumping!Great to be used on business trips,holidays,wedding,everyday usage and performance. 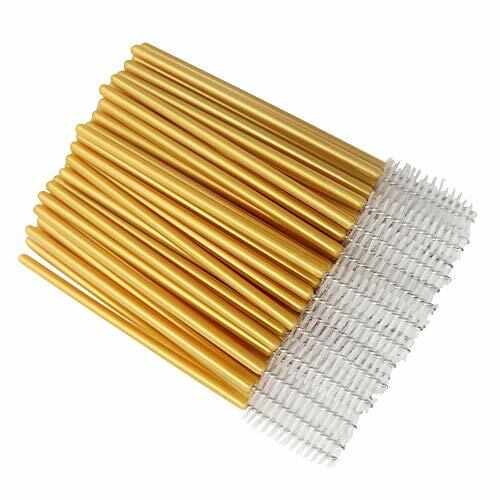 Feature 200 pcs disposable lash Brushes.High-quality material:Handle-Hard Plastic,Hair-Soft fibre the brush head can be bend slightly. Length: 10 cm / 4'' Long. *Perfect for separating eyelashes before or after mascara application. *Great for clearing away clumps of mascara. *Suitable for salon and home use. Excellent for makeup artists or beginers. The brush head can be bended slightly. Very handy and easy to use. No more clumping ! Perfect for your eyelash extension makeup. 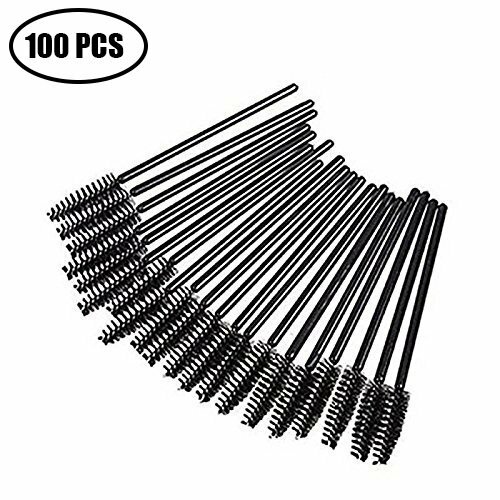 Package including: 100 PCS Black brushes. Length: 10 cm / 4'' Long. Perfect for professional beauty salons or individual home use. Material: Soft Fiber, Hard Plastic. Total length: 3.8 in - give you the better control and easier to pack in the makeup bag. *The disposable eyelash brush is easy to use and convenient to carry. *Easy application, creates lush-looking lashes without clumping. Mascara wands get dirty and linty very quick and not easy to clean. 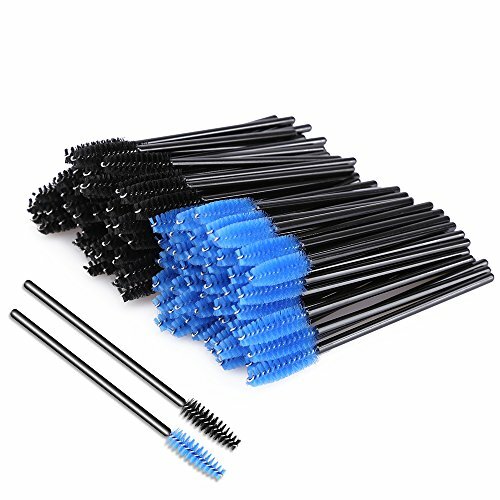 For great results every time, disposable eyelash mascara is definitely the right choice for professional makeup artist and any ladies that makeup regularly. Using disposable eyelash mascara wands is definitely more hygienic; and easy to manage and store as you don't have to wash your brush every time. Very handy and easy to use. No more clumping. The brush head can be bended slightly according your needs. Multipurpose eye lash brush are suitable for eye makeup solvent, liquid eyeliner, lipsticks, also good supplies for beginners to practice. Mascara brushes wands are light and small, easy to use and convenient to carry and store, separating eyelashes before or after mascara application. 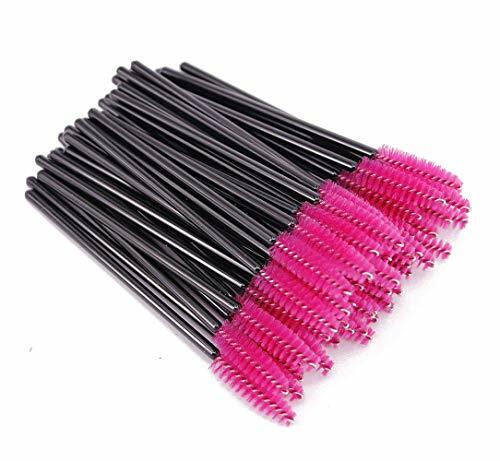 Eyelash brush is constructed of hard plastic handle and fiber hair, solid handle, elastic brush head can be bend slightly according to your need. Makeup brush kit fit to on-the-go and everyday usage, such as business trips, holidays, wedding, everyday usage and performance.  Great assortment. 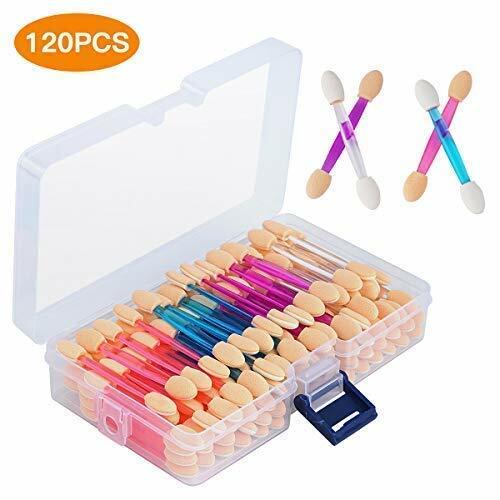 Come with 120pcs eyeshadow applicators and 4 different colors, enough to use for different purpose. Overall length: 6.2cm/ 2.44inches, the longer handle makes them easier to use and placement is precise.  Good quality. The sponge is firm enough to apply your shadow well, but not so hard that it doesn't mold to the contour of your eyelid.  Dual sided eyeshadow brushes with 2 different colors each side -- this will make it easy to differentiate when using it with multiple colors. Also great to avoid accidentally blending colors previously used with ones from a different container.  User friendly. The nice little plastic re-usable container is nice for storing them in and keeping them organized.  Great makeup applicators for eye makeup, face painting and nail chrome powder application. MyAoKuE-UP Official Store is the sole authorized seller of authentic MyAoKuE-UP products on the Amazon platform. ABSOLUTELY outstanding solution to the problem of waste when using the Latisse eyelash prescription product! No more product waste! Saves and makes latisse last longer and you can make a precise line. Great Latisse application, they are much easier to use than the brushes that come with Latisse. You're able to get right along the lash line, with no dripping or mess. Perfect micro brushes, great for detailing and getting in hard to reach areas. Suitable for makeup application, nail art, painting, crafting projects, Jewelry cleaning, gun cleaning, etc. 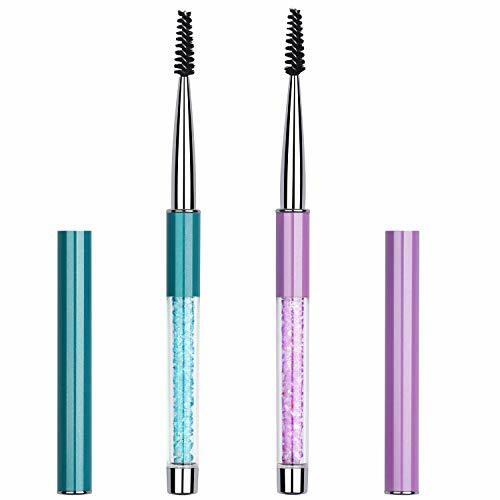 Multifuntional : disposable mascara wands are good for separating eyelashes & de-clumping mascara before or after mascara application and combing your eyebrow smoothly after eyebrow gels or waxes application. 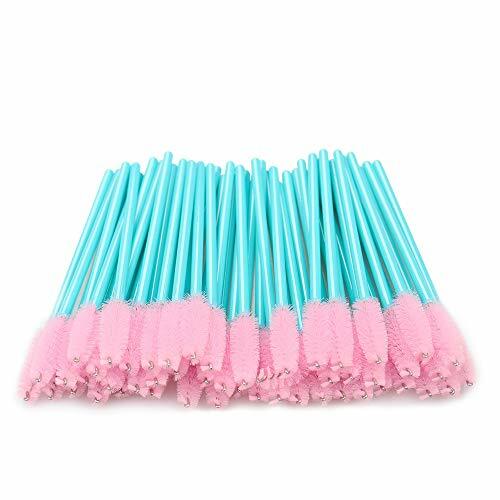 High Quality : disposable mascara applicators are made of high quality hard plastic handle and soft fiber bristles,brush head is elastic and can be bend slightly according to your need. Multi Application : eyelash eyebrow brushes can apply eyelash castor oil on your lashes or eyebrow gels and waxes on your eyebrow,even hair gel on your short hair root for superior root lift. Portable & Lightweight : disposal mascara wands are easy to use and convenient to carry,they fit to everyday usage and on-the-go, such as weddings,proms,performanc,trips,holidays ect. 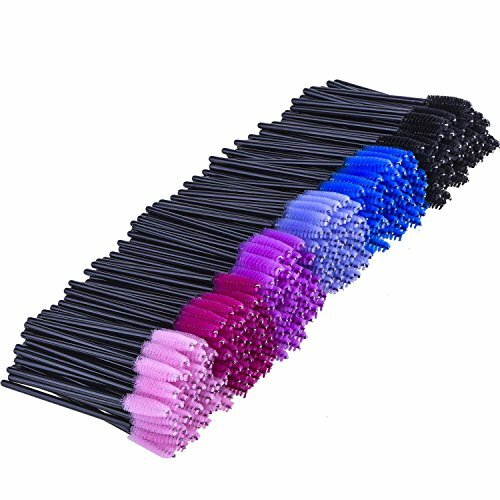 Package Include : 500 PCS multicolor disposable mascara tester wands kit,includes ten different colors eyelash eyebrow brushes,50 pieces per color. Easy application, creates lush-looking lashes without clumping. Protect your eyes by choosing the right eyelash mascara, especially you need to makeup frequently. 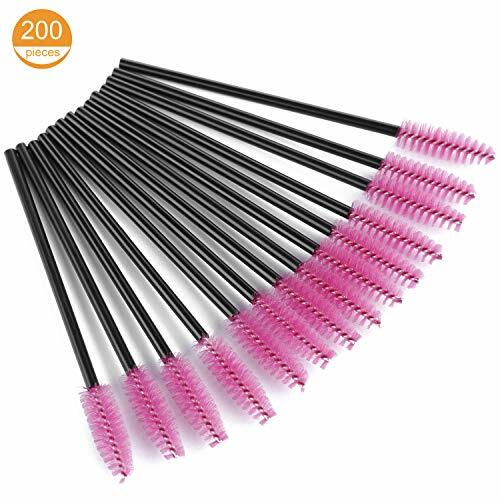 - Sanitary and clean, constant use of same mascara brush may build up germs and lead to itchy eyes, but these disposable mascara wands effectively prevent you from having itchy eyes. -Easy portability with compact size,fit in with most of the make up case and you can carry it in various occasions, such as business trips,holidays,proms ,wedding, performance,etc. 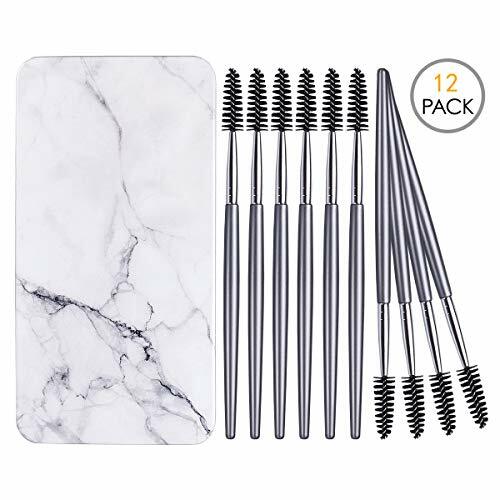 -These disposable mascara wands head is elastic can be bent slightly according to your daily needs,you can also dip organic castor oil to eye lash. 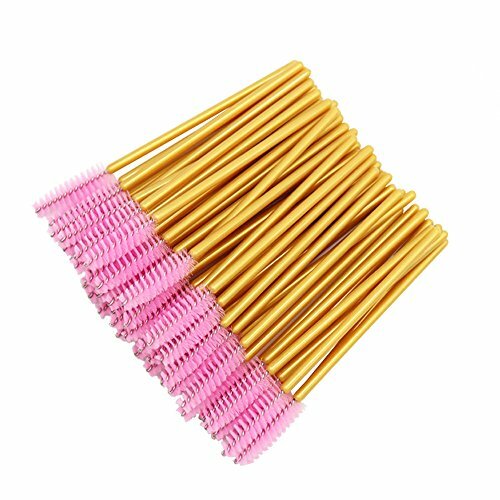 Solid and flexible: eyelash brush is constructed of hard plastic handle and fiber hair, elastic brush head can be bend slightly according to your need . Multipurpose: eye lash brush can be applied to dip organic castor oil to eye lash; Good for eyelash, eye makeup solvent, liquid eyeliner, lipstick. Daily application: makeup brush kit fit to on-the-go and everyday usage, such as business trips, holidays, wedding, everyday usage and performance. Disposable Micro Applicators Brushes: Lint free cotton heads, they are much easier to use than the brushes that come with Latisse. You're able to get right along the lash line, with no dripping or mes. Lightweight Disposable Makeup Applicators: Both mascara brushes and micro brushes are easy to use and convenient to carry,they fit to everyday usage and on-the-go, such as weddings,proms,performanc,trips,holidays ect. 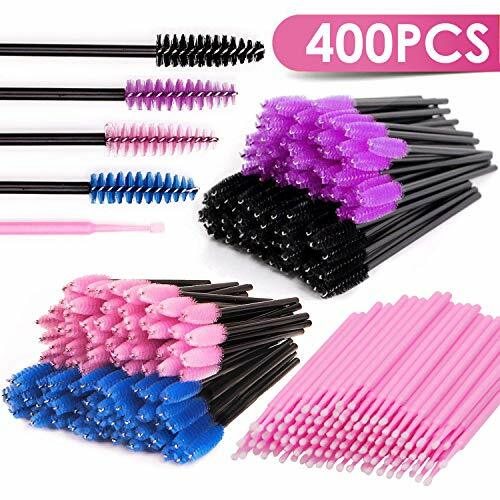 400pcs Kits: The kits including 200pcs 4 color disposable mascara brush, 200pcs pink disposable micro applicators brushes. 4. Suitable for business trips, holidays, parties, festivals, wedding, proms, and other events. -Brand new and moderate price with good quality. Overall length: 3.94-Inch (10 cm) - give you the better control and easier to pack in the makeup bag. Cute pink wands you can use throughout your lash service and even send home with clients in a homemade aftercare kit. *Easy to use and Comfortable Brushes. *Suitable for salon and home use. It is the necessary tool for lash artist. Great for professional or individual use. 100% SATISFACTION GUARANTEED-RISK FREE. If you are unsatisfied completely with your purchase, we are glad to replace it or issue you a full refund. Hollow Inside - Won't feel heavy while carry it. Adjustable head:sleek and flexible bristles show delicate makeup. Lightweight - our eyelashes brush is hollow inside which saves more material but have same function with regular brush. Won't feel heavy while carry it. Excellent material: black plastic handle with PBT wire for you to be more comfortable to use it. Eyelash extension: with help of mascara, our product can shape your eye hair that make it natural and soft but not awkward. 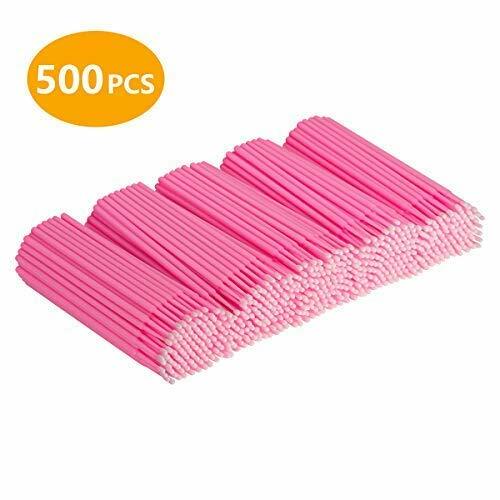 Quantity - 200 PCS in the package. Color - Red. 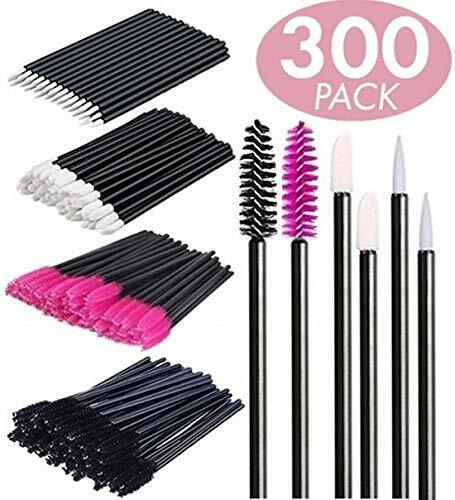 100 PCS eyelash brush and 100 PCS lip brush. 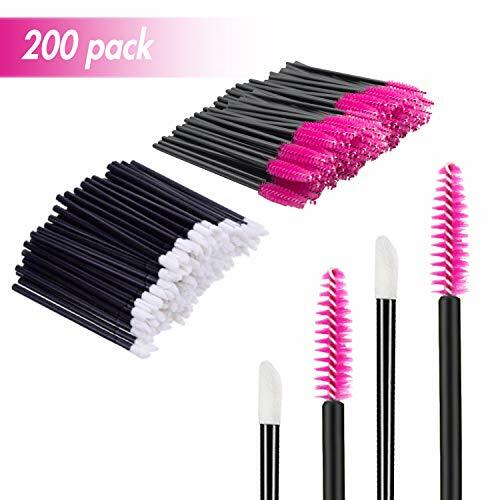 200 pcs kit:100 pcs rose eyelash brush and 100 pcs lip gloss brush. Disposable lip brush:Good for applying lip gloss,lip cokor,lipstick. Macacara wands:Perfect for apply mascara,separating eyelashes,lash extension,eyebrow brush. Disposable makeup Applicators:Eyelash extension supplies,lipstick and mascara applicatior. Convenient design:Suit for business trips,holidays,wedding,everyday usage and performance. Multi-funtion Great for separating eyelashes & de-clumping mascara before or after mascara application and combing your eyebrow smoothly after eyebrow gels or waxes application.No more clumping. High Quality Made of ergonomic aluminum handle tube and soft fiber bristles,brush head is elastic and can be bend slightly according to your need. Portable & Hygienic Come with cap to keep the brush clean and easy to store and convenient to carry,they fit to everyday usage and on-the-go, such as weddings,proms,performanc,trips,holidays ect. Multi Application Nice for applying eyelash castor oil on your lashes or eyebrow gels and waxes on your eyebrow,even hair gel on your short hair root for superior root lift. 100% Satisfaction Guaranteed If you have any questions or concerns please do not hesitate to contact us ,we will gladly get back to you within 24 hours. 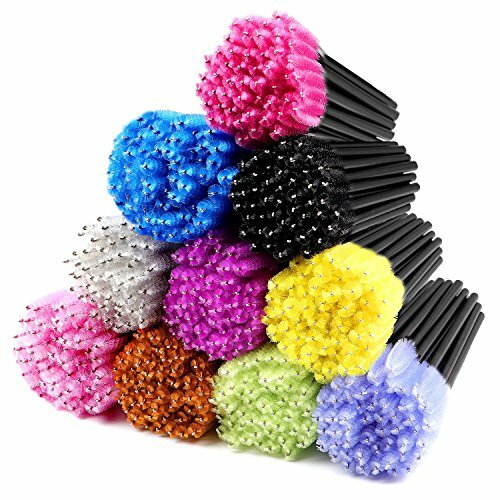 - Disposable micro brushes, you don't need to clean or wash the brushes after using them.It's one-off, preventing you from bacterial infection. - Great for multiple uses including cleaning in small areas or "hard to get to places" on some equipment. 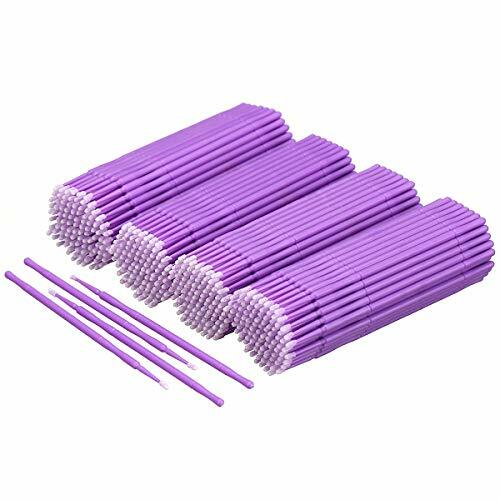 - Perfect for just about everything eyelash extension removal, nail art painting,clean jewelry ,crafting projects,sewing machine lint, model building, small parts cleaning.It also can be used for: Bonding agents, Smear,Etchants, Sealants, Crafting projects. 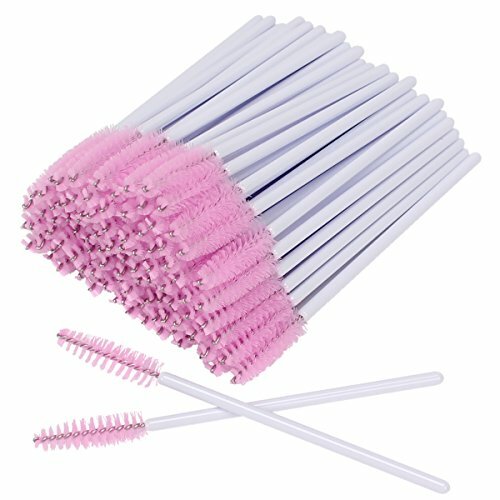 - Micro brushes are non drip and lint free.Made of microfiber tips and plastic handle,the handle can be broken to adjust the length and the tips can be bent arbitrarily for the placement of small controlled amounts ofmaterial in limited access areas.Great for dental clinics and beauty salon or your personal daily use. MultiPurpose Tools: Great for dental use, eyelash extension removal, nail art, painting, crafting projects, cleaning small gap, etc. Including cleaning in small areas or hard to get to places on some equipment. Easy to Use: Micro brush handle can be broken to adjust the length. Tips can be bend into any angle ,so getting into small places is a breeze now. Quantity: 100pcs/bag, 500 pieces total , 5 colors, 100pcs of each color. 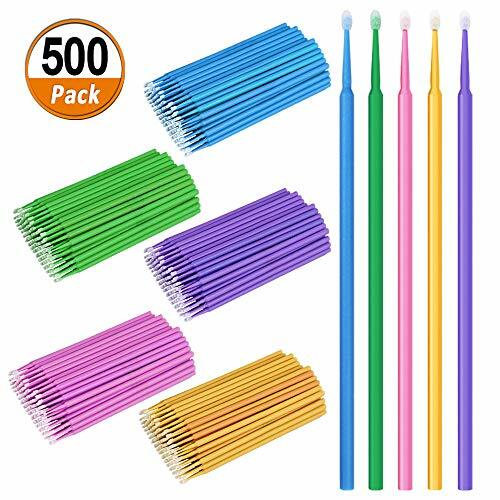 Great Assortment: package includes 3 different size micro brushes, 2.5mm blue, 2.0mm green, 1.5mm purple, 2.0mm pink, 2.5mm yellow, 5 differen colors. Reliable Material: micro applicators made of microfiber tips and plastic handle. Micro brush handle can be broken to adjust the length.Tips can be bend into any angle to clean the details. 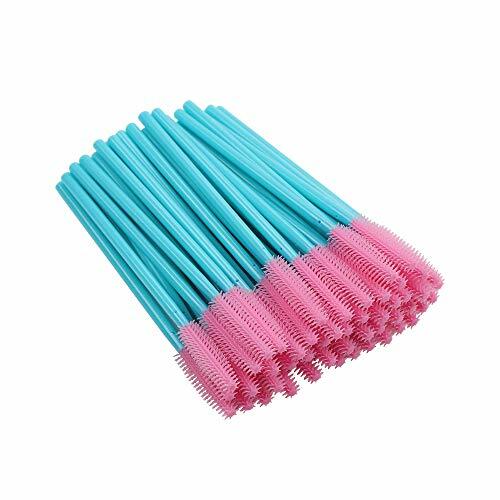 Multi-Purpose Tools: disposable micro applicator brush perfect for precise application in difficult to reach area, like eyelash extension removal, brow powder removal, jewelry cleaning, nail art, crafting projects, sewing machine, dental use, painting and much more small area hard to reach. Disposable Micro Brush: micro brush swabs are disposable, non-linting, clean and sanitary. 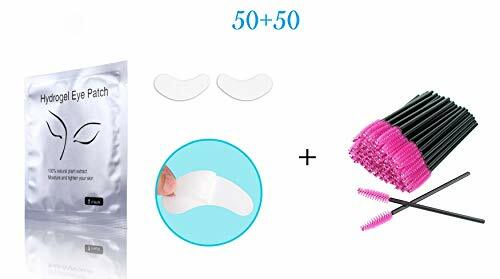 Save Your Money: the little fiber on the top makes the micro brush won't absorb too much precious product, save much more excess material. Non-toxic and High Quality Materials:Super soft PTC fiber, hard plastic and flexible metal. Easy to Use:The length of this Flying Beauty disposable mascara brush is 3.93 inches (10cm), easy to pack in your makeup bag. It can also bend slightly to satisfy your different needs. Three Colors for Your Choice: Romantic rose pink, elegant black and passionate red, there is always a suitable for you. No More Clumping: After using Flying Beauty disposable mascara brush, you needn't worry about contamination. You can just throw it away and use a new one. Besides, you could probably use them more than once if you clean them well. Professional Makeup Tool: The Flying Beauty disposable mascara brush is great for eyebrows brows, eyelash extensions, mascara application, makeup applications. Also for Home Use: It can also be used for cleaning little nooks and crannies in kitchen appliances and other household stuff. Registered Trademark:Flying Beauty is a registered trademark in United States of America, you can get perfect customer service, quality assurance. Other sellers without authorization by Flying Beauty are fake products. 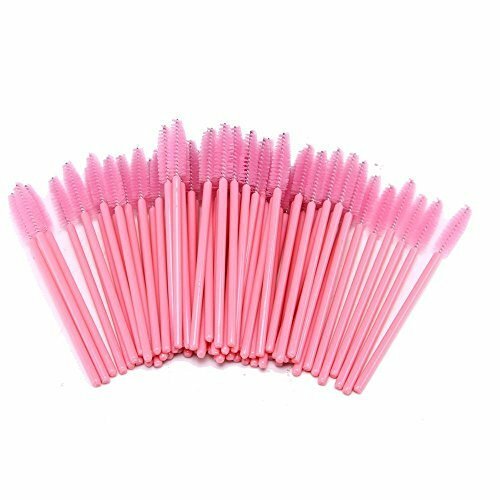 Are you still use disposable eyelash brush that waste more money? Please have a try this set and maybe you will love it ! We cannot guarantee this Special Deal Price, so just order this mascara brushes set now and enjoy your makeup application. Gorgeous package and top grade brush also can be as considerate and ideal gifts.